Could new technology bring Mizzou an ‘ACL-free’ football season? Dynamic captures 33 different functional movements for each player with a program called 'Organic Motion,' which uses a multicamera miniature studio to map players, initially in stick-figure form. KANSAS CITY, Mo. — Somewhere, there’s a stick figure with Maty Mauk’s name on it. "(We’re) going to do one-on-one comparison of you, before and after," says Patrick Moodie, president and co-founder of Dynamic Athletics Research Institute out of Lenexa, Kan., which earlier this month performed a 3-D mapping of every Missouri football player on campus. "When you were jumping before, you were using more of your hips; now you’re using more of your knees." 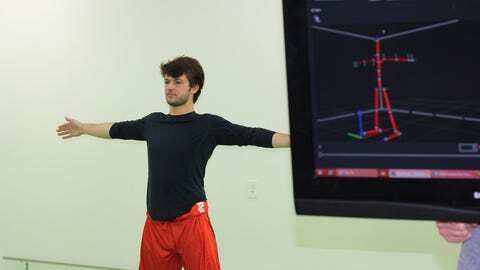 The idea behind the motion-capture technology is to keep guys like Maty Mauk on the move. The technology is a product of Dynamic Athletics, a data management company devoted to kinetics, human movement and sports sciences. Missouri Orthopaedic Institute in Columbia uses Dynamic’s system, which can identify changes and possible problems in a student-athlete’s health, movement and performance. Mizzou’s athletic department this spring is using the tech as well to create a backlog of motion-capture files — 2,310 just for Tiger football players — for the university’s training and sports medicine staffs. "Throughout the season, we’ll be able to test themselves (against) themselves," says Ryan Moodie, Dynamic’s chief information officer and co-founder. "How are you progressing? What kind of degradation patterns are we seeing? "Instead of looking at general metrics, we can look at more specifics. How do you compare to when you’re healthy? So we can make more informed decisions about (returning) to play." Patrick and Ryan say Mizzou is DARI’s first big-time collegiate client and that the school will have access to mo-cap files for multiple sports. Dynamic scanned the Tigers earlier this month over a span of roughly four days, capturing 33 different functional movements for each player with a program called "Organic Motion" — a method that uses a multicamera miniature studio and doesn’t require one of those "suits with little white balls" that fans have seen used with some popular video-game titles such as the "Madden" football series. Using Dynamic’s system, Tiger players could be "mapped," initially in stick-figure form, wearing only tight-fitting warm-up gear. Patrick developed the intellectual property on DARI about 11 years ago and says it has undergone a number of tweaks and restarts since. The Carlton Blues, an Australian Rules Football team in Melbourne, are in their second year with DARI, and this past season "was a zero-ACL (injury) year," Patrick says. "We’re talking the first time in 100 years they’ve had an ACL-free season." Another DARI proponent is Tom Boers, a back specialist whose clientele includes golfer Phil Mickelson; Dynamic is hoping to get more colleges — and conferences — into the mix over the next few years. But the Tigers are the first real NCAA guinea pig. And if they can somehow notch an "ACL-free season" themselves, they’ll be a mighty happy guinea pig, too.